Very little information is available about the early years of the section and its founding. From the bits of information gathered recently, the following can be pieced together to form a picture of the origins of the section. A small group of individuals residing in the District of Columbia gathered in the fall of 1902 to form a club, the Washington Society of Engineers. 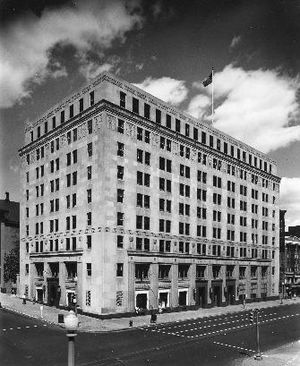 They held their meetings at the George Washington University, located at 15th and H Streets, N.W., on the present site of the former Woodward and Lothrop Building. They filed an application for branch status in the American Institute of Electrical Engineers (AIEE) and were formally admitted as a branch, as sections were called then, on April 9, 1903. Apparently this event was celebrated at a dinner at the Cosmos Club. From its inception, and for several years after, the papers presented were prepared by members and local people, as the branch had few or no funds to defray the expenses of outside speakers. The annual dues were $20 for fellows, $15 for members, $10 for associates, and $1 for local members. The regular meetings of the society were held each month from October to April, inclusive, usually on the first and third Tuesdays of each month. The Transactions of the American Institute of Electrical Engineers of 1904 show that the Washington branch had 28 members on January 1, 1902, and 44 members plus one AIEE student member on April 20, 1904. Ten meetings had been held since October 1902, with an average attendance of 58 people, and 13 original papers had been presented. It was probably through the influence of Dr. F.A. Wolff, Jr., that the meetings were held at the George Washington University. From information obtained from Prof. L.D. Bliss and Mr. Philander Dougherty, the sparkplug of the organization was Mr. Philander Betts. We are glad to say that the interest in the meetings is well sustained and the prospect for the future is bright. In order to keep up a general interest we have had to introduce a new subject and we feel that our proceeding in this respect is accountable for the sustained interest in the meetings. The membership of the Washington Branch in 1903 numbered 44. The national membership was as follows: 417 members, and 1,810 associates, as well as 2 honorary members, for a total as of May 1, 1903, of 2,229. The Washington section, composed of fellows, members, and associates of the institute residing in the District of Columbia and vicinity, was organized April 9, 1903 and affiliated with the academy [Washington Academy of Sciences] in 1912. This membership, varying in numbers from time to time owing to change of residence of fellows...averages about 75. The early records are sparse beyond this. We have the complete address of Chairman Samuel Reber at the time of the fall meeting in October, November or December of 1904. We also have the minutes of the Branch meeting of February 5, 1907. There is no record indicating any special occasion celebrating the founding and chartering of the branch. The records show only that the branch was formed. We do, however, know a little about the beginnings of standards setting and about the early days of power engineering in Washington, D.C. In 1904, the National Bureau of Standards (now the National Institute of Standards and Technology, or NIST) occupied one building and a second was under construction. Congress had appropriated $25,000 for the site, $325,000 for two buildings, and $225,000 for apparatus and equipment. The larger building was called the Physical Laboratory and the other the Mechanical Laboratory. The act established the bureau and provided for 14 positions at an aggregate salary of $27,000 The next year (1902-1903) the number was increased to 24 positions with an aggregate salary of $36,060. The third year (1903-1904) positions were increased to 58, with an aggregate salary of $74,700. In the 1904-1905 fiscal year there were 71 positions altogether in the bureau, with the aggregate salary of $85,780. An aerial photograph of the Bureau of Standards dated 1953 is available. At the Potomac Power Company (known since 1953 as the Potomac Electric Power Co.), a description in a 1904 handbook noted the following: "The two phase system of distribution is gradually being displaced by the three phase system, current for which is furnished by 1 2000KW turbo-generator of the Curtiss type which was recently installed in the plant at 14th and B street, N.W." A picture of two turbo generators is available in the new Potomac River Plant. Mercury resistance standards are sufficiently reproducible so that different labs agree to within 2 or 3 parts per 100,000. Wire standards are now so constant that a reference to mercury ohms need be made much less often. Or consider this description of antennas that is known today as radar. As described in Radio-Telegraphy Dampened and Undamped Oscillations (1912), an experiment was carried out between the Naval Academy at Annapolis, Maryland, and the Radiotelegraphic Laboratory in Washington, D.C. The antenna at Annapolis was approximately 150 feet high. The antenna at the Radiotelegraphic Laboratory was approximately 180 feet high at the top and 60 feet at the bottom. This way it was possible to calculate the ground absorption. The final calculation found 64 percent of the signal was lost over land. It made no difference whether the waves were dampened or moderately damped oscillations. According to one source, the Great War demonstrated that modern wars are not of armies but of peoples, and their resources and their intellectual and industrial resourcefulness are more important than the identical equipment of armies and fleets. Therefore, a government that pays attention to education and research and industrial developmental work is making the best preparation for possible wars of the future. "...If the government will cooperate with the industries in peace as effectively as the industries cooperated with the government in war, it would be of vast benefit to the public, which pays all the costs." Performance curves showing the instantaneous demands made upon automobile starting and lighting batteries when cranking the engines have been obtained recently at the Bureau of Standards. These curves were made while preparing specifications for this type of battery for the motor transport division of the War Department. In the course of these experiments additional information was obtained with respect to the operation of the starter system and the engine itself. In March 1921, experiments were conducted under the supervision of the U.S. Naval Research Laboratory on radiotelegraphy. The details are extensive; some of the description is as follows. Several experimenters have attempted to measure the wave front angle by means of receiving loops. In the final experiments the mast with its pivoted antenna and instruments was erected on the Anacostia Flats not far from the Washington Navy Yard. The absence of wire lines and houses within a distance of more than a quarter of a mile made this an ideal location. Preliminary observations had been made at the Bureau of Standards in the summer and autumn of 1919. Unfortunately the work at Anacostia was stopped because the 50-foot pole for the antenna was considered too dangerous for the aviators at Bolling Field! In 1923, a radio program talk show on WRC, under the auspices of the Smithsonian Institution, was announced for February 19, on the topic "What the Earth Is Made of." Later that same year, the Washington Academy of Sciences resolved to petition the President of the United States and the rest of the federal government to provide by law and to appropriate the necessary money for the attendance of scientists designated by the federal government at scientific congresses, conventions, and meetings in this country. It was argued that these appropriations would be exceedingly small as compared with the returns from them in great benefits to scientific advance in America and to the promotion of the national welfare. The Potomac Electric Company (DC) was the home of teh AIEE section from 1932-1953 (see phtot below). Early in World War II, there was an agreement between the British and the Americans aimed at avoiding duplication in military research and development. This identified certain fields of work where one side would do all of the work, and would share the results with the other side. Thus the United States was to do all of the work on guided missiles and would provide the British with their results. By the end of 1944, the end of the war was in sight, so this seemed to be the right time to send a team to report to the British Government on the American work in this field. Five of us were sent to Washington: an aerodynamicist, a specialist on gyroscopes and guidance systems (both from the Royal Aircraft Establishment) and two electronic specialists (from the Telecommunications Research Establishment), of whom I was one. The fifth member was a senior British civil servant, charged with making the arrangements with the US Government organizations, laboratories and companies we were to visit. We traveled by sea to New York and by train to Washington. After four years of blackout, rationing, shortages, air raid damage and general drabness, Washington was a revelation. With the bright lights, modern cars and abundant food, it was another world.The BAC was located on Dupont Circle. We all lived at the Gralyn Hotel at 17 and N St. NW. We used this as a base for visits over most of the US. The BAC had its own aircraft parked at Bolling Field: a twin-engine Beech craft painted in Royal Air Force colors, with a US flight engineer. The RAF Group Captain in charge at the BAC enjoyed piloting us in this aircraft to and from many of our destinations.We were welcomed and entertained everywhere we visited. We were provided with all of the technical information we sought, without reservation and often with considerable pride. It was an episode of the war I shall always remember with pleasure and with gratitude. Harold W. Lord wrote about some of his work from 1943 to the end of WWII. He was 'loaned' out to the Naval Research Laboratory in Silver Spring, MD. His responsibility was to design and develop all of the transformers needed for a new 'friend or foe' system. It required him to develop small transformers to operate in the 25 HZ to 1000 HZ. In his capacity he worked 40 hours a week in Silver Spring, then returned home to Schenectady, NY for his weekend job. He also traveled to Fort Wayne and to Boston to the MIT lab. He kept records of all his travel, which amounted to 26,000 miles as well as working six days a week! C. Richard Ellis wrote that he worked at the Naval Research Lab in Silver Spring as a technician in the aircraft radio group. He was originally working with the British radar and IFF (Identity Friend or Foe) equipment. W.A. Dickinson wrote that he participated in research of radar designs and display tubes at the Naval Research Laboratory. Kenneth R. Jackson wrote that his career started at the Naval Ordnance Laboratory in Washington D.C. His boss's boss was Dr. John Bardeen, who was later awarded two Nobel Peace prizes, one for his contribution to the development of the transistor. It is not clear whether Dr. Bardeen actually worked at the Ordnance Lab. Howard O. Lorenzen wrote that he joined the Naval Research Laboratory with experience in radio design. He worked on designing UHF receivers and worked on some of the first radar receivers. During WWII, he was involved in designing countermeasures for various German electronic controlled devices. After the war, he formed the electronic warfare branch, which developed countermeasures for the Korean and Vietnam wars. Not to be outdone with all this radar stuff, a "simple" item like the weather was important to Francis J. Heyden. He went from being a Jesuit priest to a weatherman via the Philippians to Georgetown College Observatory! After the war, he worked with the university's radio station, WTB. Over the next 26 years, he produced three outside broadcasts. The first was "the mass for shut-ins." The second was the "blue gray show." The third was the Georgetown University forum. Al Gross wrote that he built the first hand held-radio in 1938! On the eve of WWII, a magazine article on the radio caught the attention of the Office of Strategic Services (OSS), the precursor to the Central Intelligence Agency (CIA). The OSS panel commissioned Mr. Gross with assembling a group of people to secretly design and build hand-held radios, which would operate on high frequencies. From there he went to the Federal Communications Commission (FCC) for licenses to create the citizens band radio, and the first voiceless pager (e.g., beeper) in a hospital. Harry D. Young worked at the Maryland Electronic Manufacturing Corp. (MEMCO) in College Park. MEMCO had a contract with Lockheed to do a radar signature analysis on a new fighter aircraft. In 1958, MEMCO was acquired by Litton Industries. In 1963, the American Institute of Electrical Engineers (AIEE), affiliated in 1912, merged with the Institute of Radio Engineers (IRE), affiliated in 1933, to become the present-day Institute of Electrical and Electronics Engineers (IEEE). With the merger, the IEEE was given the same seniority as the elder of the two professional societies. Electrical engineers contributed to many significant advancements in technology and scientific research in the 1960s. In the 1960s, electronic digital computers were first used by the Coast and Geodetic Survey for determining the location and origin of earthquakes. The system utilized punched business machine cards with coding for the reporting station and the exact time of the first shock wave. It was believed that the results were accurate to within seven miles of the point of origin. Fred Tischer wrote that in January 1962 he was temporarily reassigned from Ohio State University to NASA Goddard Space Flight Center. He was associated with plasma and re-entry communications. The availability of scientific and technical information was unique. At the Laboratory of Experimental Neurology at Georgetown University, the electromagnetic field associated with neuronal activity was demonstrated for the first time during the 60s. Following the rules of Maxwell's equations, this event suggested a new method for studying and mapping the nervous system of animals and humans. Of especial significance was that mapping could be achieved without having to make direct contact with the structure under investigation. At the National Bureau of Standards, the 1960s were essential years for basic research on laser devices. In one study, emphasis was given to the development of the helium-neon gas laser as a monochromatic collimated light source for the interferometric measurement of path lengths. Other studies employed solid state lasers, e.g., the pulsed ruby laser for high power applications. In 1962, in an address at George Washington University, the director of research of the Naval Research Laboratory, Washington, D.C., cited a prediction by the Institute of Radio Engineers (IRE) in its 50th Anniversary Issue. It was predicted that within the next 50 years communication between man and machine would be perfected to a degree that would permit coupling between the human mind and the mechanical brain. This communication, it was alleged, would be much closer than between two human minds. Today we see the outcome of this prediction, and it portrays the significant role of the electronics engineer in today's society. In the 1960s at the Department of Commerce, Weather Bureau, Washington, D.C., the successful tracking, warning and forecasting of hurricane storms was demonstrated by the use of high-powered weather radars installed along the Gulf and Atlantic coasts. These radars are credited with the saving of many lives and the escape of many citizens from serious injury. In the 1960s the Navy issued contracts for the design, development, and implementation of Naval Tactical Data Systems (NTDS) for secure electronic communications between fleet commanders and their staffs. Department of Defense (DoD) contracts were issued for the design and development of electronic data links to identify friendly aircraft within a given airspace. Known as Identification, Friend or Foe (IFF), these systems preceded modern transponder development, the critical devices that are used every day to identify en route aircraft within the nation's airspace. DoD contracts were also issued during the decade of the 60s for the design of very low frequency shore-to-ship submarine communication systems and for the design and deployment of sonobuoys to track and locate foreign submarines. Till 1971, the Washington Section covered the Greater Washington metropolitan area, consisting of the District of Columbia, suburban counties of Maryland, and the northern Virginia suburbs. In 1972, the latter became the Northern Virginia (NOVA) Subsection, and then changed to a full-fledged NOVA Section in 1977. The National Capital Area Council (NCAC) was also formed in 1977, in order to coordinate certain common activities of the two Sections, such as general administration, publication of their Newsletters, management of the Annual Awards Banquet and conferences held in the area, etc. The NCAC was dissolved as of 2003, but the two Sections have continued to cooperate on issues of common interest, and run joint Chapters of several Societies. Thus, the histories of both Sections are intertwined over the last 40 years. For many Washington Section members of the IEEE during the 1970s, technical achievements often appeared to be eclipsed by the turbulence felt across the country, but centered in Washington, D.C. The decade started with conflicts surrounding an unpopular war in Southeast Asia and major demonstrations in downtown Washington. Then there was the constitutional crisis of Watergate, leading to the sight of a disgraced President waving goodbye from the doorway of a helicopter on August 10, 1974. The fallout from this occupied the next administration and acted as a catalyst for the election of Jimmy Carter. The end of the decade saw a full-blown recession and long gas lines. However, even during these trying times there were many technical accomplishments that IEEE members were instrumental in achieving. At NASA, the flight of Apollo 17 ended a decade long lunar exploration program, when on December 14, 1972, the lunar module Challenger lifted off from the moon. Former President Lyndon Johnson, who had drafted the act establishing NASA and who was a major proponent of manned space flight died of a heart attack shortly thereafter, on January 22, 1973. Skylab3 was launched in 1974 using components of the Apollo Program. By 1975, the Apollo-Soyuz Test Project combined the assets of two nations' lunar efforts to achieve the first international rendezvous and docking procedures, which would aid in the planning of today's International Space Station. Even before this flight, Pioneer 10 was launched in March 1972, ushering in an era of unmanned exploration, and Voyager 1 and 2 were launched in September and August 1977. Planning and construction for the Space Shuttle program began in the last half of the decade. But, in almost all of the professional activities of IEEE members of this time, and in many other ways, the greatest impact was that of the digital revolution and the integrated circuit. Military and space electronics transitioned from analog electronics with ferrite core memories to semiconductor microprocessors and DRAMs. All were affected by the advent of cheap calculators and personal computers that were introduced in this period. Many found that by the end of the decade they wore a digital watch and their children were playing with a Texas Instruments innovation called Speak and Spell. 1970: Intel delivers the first 1024-bit DRAM. 1971: Bell Labs researcher Dennis Ritchie announces the C programming language and Intel delivers the first large-scale integration (LSI) processor with the 4004, which contains 2300 transistors. 1972: SPICE1 is released by UC-Berkeley, and the HP35 calculator from Hewlett-Packard and the SR10 from Texas Instruments introduce subcalculators at less than $400, affordable to college students. 1973: The first logic analyzer, the HP1601A is introduced by Hewlett-Packard. 1974: The eight-bit Intel 8080 is introduced and becomes the basis for the PC revolution. 1975: Arguably the first PC, the Altair 8800 is introduced. 1977: Apple computer introduces the Apple II; Radio Shack introduces the TRS-80 PC. 1979: The Motorola 68000 is introduced, which will be used in the Apple Macintosh. Meanwhile, members of the Washington Section were active in many areas. On April 9, 1971, Dr. George Rado received the Navy Award for Distinguished Achievement in Science for his research in magnetism. He was employed at the Naval Research Labs. Also in 1971, Donald Dinger became Associate Deputy for Research and Development of the U.S. Army Mobility Equipment R&D center at Ft. Belvoir, Virginia. In 1975, when the Army's Harry Diamond Laboratories headquarters moved from NW Washington to Adelphi, Maryland, there were many retirements, including those of BillyHorton, Technical Director, and P. Anthony Guarino, Associate Technical Director. In 1976, Howard Jones, Chief of the Microwave Branch of Harry Diamond Laboratories, was given a Meritorious Civilian Service Award from the Army. He was a Fellow of the IEEE in the microwave area. Also in 1976, Frank Reggia of Harry Diamond Labs received the Army R&D Achievement Award for his efforts and accomplishments in conformal antennas for military systems. Officers of the Washington Section over this decade included Harry Fine, Robert Miller, Forest Hogg, Leland Whitelock, Stuart Bouchey, Marjorie Townsend, Robert Briskman, John Kelleher, Dennis Bodson, Alvin Reiner, Herst Gerlach, David Crandall, Saj Durrani, Richard Bache, Gideon Kantor, and George Abraham, who was the IEEE delegate to the Washington Academy of Sciences from 1975-1979. It is especially amazing to see the longevity of some members contributions to the IEEE. Both Saj Durrani and Gideon Kantor are still active in the Section today. By the 1990s, the membership of the Washington Section had grown to approximately 6,000. The Section had established an annual National Capital Area Awards Banquet in conjunction with the Northern Virginia Section, also numbering more than 6,000 members. The Section had taken on a more administrative function, while technical meetings were conducted by various chapters. By the turn of the century, there were more than a dozen active chapters, many focused on technologies undreamed of at the beginning of the century, such as antennas and propagation, advanced signal processing, electromagnetic compatibility, remote sensing, and electron devices. 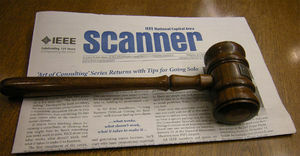 By this time, the two National Capital Area sections had established a joint newsletter, the Scanner, to keep area members apprised of technical meetings and area events. Also, The NCAC established a Web site in 1997. The IEEE Headquarters did not provide centralized hosting of web sites at that time, so we had to apply for our own domain name, and pay for the web site hosting space. Names of the Section and NCAC Chairs for the last 40 years are available on our Web sitesBy the 100th anniversary of the Washington Section, there were plans to take advantage of modern communications technology to move the Scanner from a print medium to electronic communication via the Internet. These plans led to the present eScanner website. Other accomplishments of the 1990s included the establishment of an international Sister City relationship with the IEEE membership in New Delhi, the creation of a new affinity group, Women in Engineering, encouraged and supported by the Washington Section, and offerings of numerous relevant continuing education courses inspired and produced by section officers and members. The 100th anniversary of the chapter was recognized by a celebration at the Cosmos Club in Washington, chosen because of its role in the formation of the Section a hundred years before. 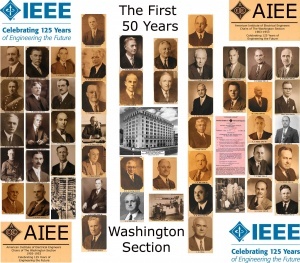 The members of the Washington Section can be proud of their long heritage and their contributions to the fields of electrical engineering during this time of great transition. The lineage of Washington Section Officers dates back to our early members (Alexander Graham Bell) and Dr. F.A. Wolff, who served as Chair of the AIEE organization in the 1903-04. Over the past 50 years, the succession of leadership has included the 'passing of the gavel' which has been a tradition maintained over a 100 years.